Save up to 35%, why not try? Enhance your natural eye colour with FreshLook One Day contact lenses. A proud creation of Alcon & Ciba Vision, these convenient coloured contact lenses offer an exciting update to your iris, with four shades available to complement your eyes while offering clear and crisp vision. Also available for purely cosmetic use (just select ‘0.00’ on the prescription details table), these daily coloured contact lenses are exactly what you need to complete your outfit for a stylish addition to a night out. With a thin and smooth design, these coloured contact lenses are a great choice whether for prescription or cosmetic use, keeping eyes feeling fresh and comfortable all day long. FreshLook One Day contact lenses work to blend three colours together, creating a subtle, natural and stylish update. 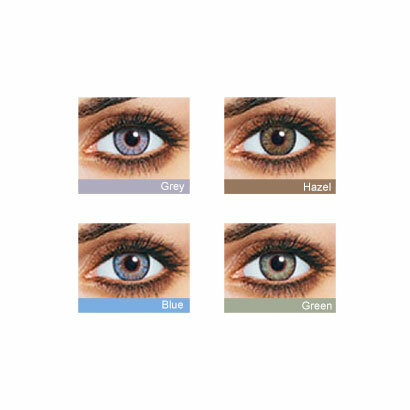 Introduce these coloured contact lenses to your daily routine, or just for a night out, and find your ideal look with our range of four colours, including blue, grey, green and pure hazel. 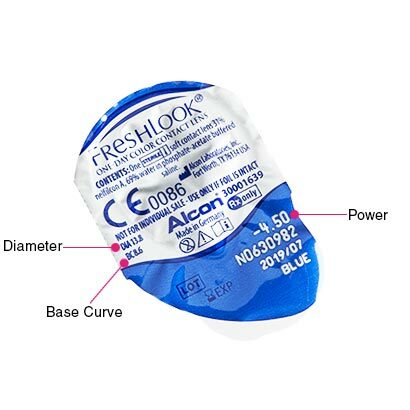 The effects of these coloured contact lenses will vary depending on your eye colour, skin tone and hair coloured, however blue and grey FreshLook contact lenses typically add more depth to blue colours, while pure hazel can work to lighten the colour of brown eyes. Enjoy total convenience with FreshLook One Day contacts, daily disposable contact lenses that can help you achieve your desired look and offer visual correction. Enjoy a full day of wear then simply dispose of your lenses before going to sleep, and just put a new pair of lenses in the next morning. Read our guide on how to choose the best coloured contact lenses for you. 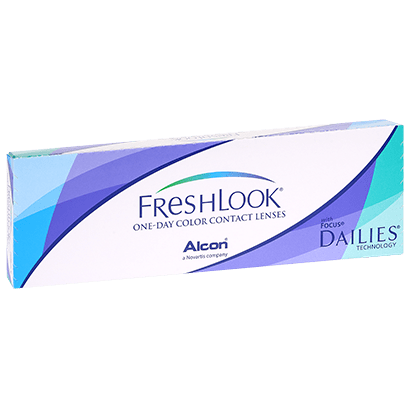 FreshLook Colorblends are a great monthly colour contact lens option for anyone after a subtle update of their eye colour. And, for a silicone hydrogel lens that offers a natural look, you can try Air Optix Colors. Hadn''t worn contacts for well over a year but these were comfortable enough to wear for most of the day straight away. Amazing contacts but the colour blue isn''t the shade I want. It looks more like brown contacts then blue when wearing? them. Love them, they are so comfortable. & quick delivery, recommend this company . Amazing. Deleverd next day. 1st class service thank you. Warren. Have tried them before - still a good product. The product, I’ve been using for a long time so I know but I’m impressed by the shipping of the product! The product is very good and prompt delivery is brilliant but i have received the voucher worth of £75 for wine only i am a Muslim and i do not drink i felt bit let down due to that. If feel good can give more options to loyal customers it can benefit business and the customers both. This was my first time using contacts after many years of contemplating. These contacts are wonderful! After finally getting the hang of inserting and removing the contacts, it has now become effortless. The feel soft and light within my eye, especially within the daylight when i can hardly tell they are within my eye. At low light however, they are more evident in the eye due to my pupil expanding but this is easy to get used to. For someone like me who was extremely dubious of contacts, i couldnt recommend these more to first time users! O have already placed my second order and shall be shortly back for more. It would be lovely if a few more darker tones could be added to the range but the pur hazel is gorgeous. Finally, communication via email and delivery was extremely fast! Thank you. Quick and intact. Thank you! They look absolutely beautiful. Very very comfortable- one of the best ones used ever! Nice colour but did not fit my eye. Why only do them in 1size? I love these contacts! If you look after them well and clean & store them well at the end of the day - you can wear them for significantly longer than one day. Great choice! Amazing service as always and always leaving a little treat of haribos makes you smile when you open the package, i wear grey dailies for brown eyes and managed to convince people they are real however the down side is i wish they did have a seperate lens for the ‘left eye’ as they all come in ‘right eye only’ boxes because i dont like how some of my natural eye is shown in the left lens because its supposed to be for the right. Thats the only thing that they could improve on but other than that it is worth the money and i would highly reccommend to others to buy from here. Really wished they had more colours in this wear ( daily uses), as it is helpful for first time wearers and those that only wear this as fashion and that wear them without prescription. I feel very comforting in thes lenses..
Easy to use. Fantastic, thank you. Great lenses will definitely be using this company again. Lenses start to break when my wife was wearing them.So she had to bin them and she wear glasses to attend a wedding.Very disappointment !!! Quick delivery. However the colour was not bright at all. Barely noticed a change. Happy with the product. 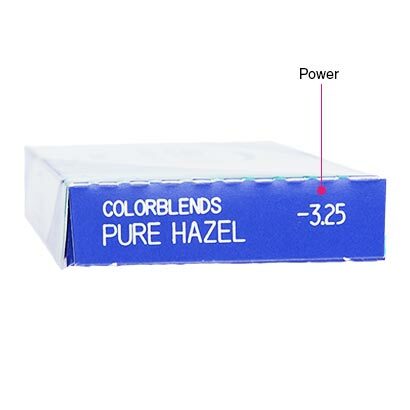 I ordered these contact lenses in pure hazel. They are comfortable and they look natural which is exactly what i am looking for. Thank you! These contacts are my favourite; I purchased a variety of colours and as they are so comfortable to wear I can change them daily and throw them away. I won’t use any other lende now, nor any other company. They are fabulous! I have very dark eyes almost black, these contacts looked really pretty, very subtle grey. Only problem they look like I have a wonky eye in person so be aware of that. Also start giving u headaches after 6 hours. By 10 hours I had to take them out cause they hurt! I recommend them for occasion wear, they do sometimes bounce around in your eyes. Overall very pretty! These are excellent quality, comfortable lenses. Good to have coloured disposable lenses as a time saver, the colour was subtle but looked really natural. I have purchased these twice now, the first time i opened one of the lenses and the edge of it was broken therefore i was unable to use it. And this time I had the same issue, the edge of the contact was chipped and no way i could wear it with comfort, also when i put one of the contacts in it fell apart in my eye with one blink. other than those teo major issues i find these contacts comfortable but only for a fee hours then they start to irritate. Great service and prompt delivery. Received contacts when stated, in perfect condition. Quick delivery quite good product would l order again yes! Great and comfortable. I got pure hazel and it looks really good on drak brown eyes. I love this lenses! They are perfect for daily basis as it looks very natural. The delivery was pretty quick too. Comfortable and great colour however wearing for more than 7 hours made my eyes dry. Good quality,nice colour. It was worth a try,but I could not wear it longer than 5 hours. This was my very first purchase and I''m generally satisfied. Not quite the color change I was hoping for, but it''s alright. If the lighting isn''t good or if a person is 2m away from me you won''t notice anything... The comfort is good. I also ordered a monthly pack of airoptix and the color change was good, but the lenses a little blurry... but I''ll talk about this in my next review. Daily colour lenses are quiet unconfortables and the colour is not intense at all. On light brown eyes change something but you cant make too much different as another that i tried before. 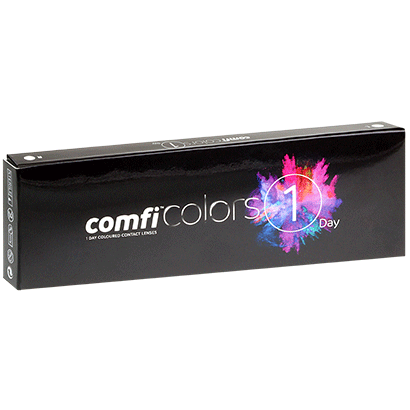 These coloured daily contacts are really comfortable to wear. Couldn''t be easier to wear a new lense every day and throw the old one away every evening. Hygienically GREAT. Love the gray lenses, its beautiful! This is a good product but too expensive you will waste money on 1 pair that comes out of 10 i would reccomend it defo the colours are worth it but the price needs to be reduced. Nice subtle colour, had many compliments. Good product but sometimes makes my eyes dry. Very good customer service and delivery. A great website with great service and cost efficiency. I was happy wi the service I received. Great product, excellent service, prompt delivery. Great value for money. Very quick delivery. Excellent Service, Best Prices, Great Product! Good quality product, fast delivery, reasonable price. Great service prompt next day delivery option with no extra charge. Love these lenses, find them very comfortable. No issues, as described. I recommend this product. Great quality. Great service. Well Done! Bought the blue coloured contacts, they are not as blue as I thought they were going to be as I have blue eyes already and didn''t really make a difference to my eye colour! If anything they made my colour duller. I like the Freshlook One Day lenses to use occasionally when i go out to special events, they are too expensive to buy for daily use. I wish there were more colours in this range, like there are for the colourblends. Great price. Be sure to check the diameter! Subtle colour changes particularly on brown eyes. Detailed print of colour design on lens. Makes my eyes dry but could just be me. Use all the time absolutely love them! Value for money. Good service and quick delivery. Lenses were extremely comfortable and looked very natural! Easy to wear, comfortable lenses. The contact lenses are comfortable and very suitable for my dry evyes.And also they are delivered soon after my order and arrived next day. Good product. The colours work well over my dark brown eyes. 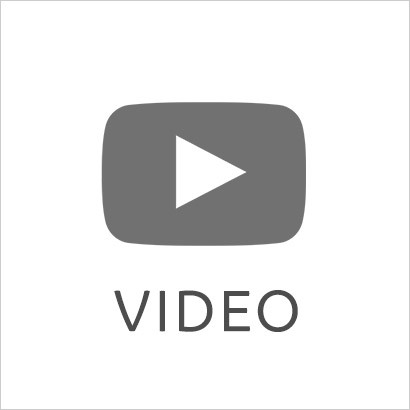 Excellent and great for all the shows I use them in. They''re easy to insert and remove and the delivery speed is an added bonus. They never fail me. Great colour. Only issue is it starts to dry out after 4/5 hours. Love the dailies brand and i'm so pleased to buy colours in a one day format, the material and size of the colourblends monthlies didnt agree with me, i just hope they widen the colour range. great service and amazing price. Good colour choice and for the main, these are good quality lenses although on a few occasions, one has split whilst in my eye which was slightly terrifying. I love these lenses, they have a smaller diameter than the others which makes them extremely comfortable. Excellent colour and nice subtle change to brown eyes! They were really nice on the eyes almost look quite natural. Comfortable to wear! Well priced and long lasting. My first experience buying coloured contact lense online, which impressed me. The diameter of Freshlook One day is perfect. The most comfortable lenses ever!!!! Quality was amazing. Would definitely recommend. Luv these lenses, I used to wear monthly coloured but switched to daily coloured for comfort and hygiene. No surprises here - not the most comfortable lenses, and if people look closely you will obviously be wearing colour contacts, but a good product none-the-less. I''m unable to wear these without acquiring a headache at some point after removing them. Does anyone else have this issue? The colour is great though (green) enhances my natural hazel eyes, making them shimmering pools of khaki fringed in grey. Very comfortable and look great!! Great product just as described. Love these! Comfortable and quite natural looking, often get complimented on my eye colour. Hazel grey and green look best on dark brown eyes. Been using for a while now, good quality product. no irritation. Maybe just check colour before buying. Love them! Very comfortable and very natural. Fantastic products and very comfortable to wear throughout the day. Will recommend this. Comfortable lenses with subtle change to my looks. Love this website. Contacts are good quality and sold for a much cheaper price. Delivered really fast. I purchased these in green to enhance my natural eye colour. Love the colour and will definitely buy again. Haven't given 5 stars as I don't find them as comfortable to wear as the Acuvue lenses. Great quality and perfect colour. I purchased grey which was very subtle but noticeable on my extremely dark eyes. The coloured lenses are bad does not show any colour. Fantastic contact lenses. Feel comfortable all day long. Easy to use and it looks nice in the eyes. I wear the hazel. Very comfortable and the colour is subtle but noticeable. The contacts are blurry and unconformable. Not happy with the way they look either. Very natural looking yet adds a hint of pleasant difference to your look! Very comfy and stay moist u like other ranges I have tired. They are really good contact lenses. They blend in well. People can''t tell that you are wearing contact lenses.